Personal projects are very important. Photographers must always develop their skills, practice those skills, invent new techniques, and keep their portfolio updated, these are all things that personal projects can provide. They can be intimidating to setup, however. One idea I’ve heard from several sources lately is to approach the project as if you were shooting an assignment for someone. This helps provide direction to the project that helps one cope with the intimidation. I’m going to tell you a bit about how I setup my most recent project. I came up with the idea that I would shoot as if I was creating an ad for a cultural/musical festival. I did have a specific festival in mind, although I don’t want to name it here. Belly dancing was a great fit and I had worked with a dancer before whom I felt would be willing to do a shoot like this again. However, for this project I felt it important to include her dancing partner. So I asked them both if they’d be interesting in doing a trade shoot. We then set out trying to come up with an appropriate location. I was thinking something that would create a Mid-Eastern coffee house sort of feel. After trying to come up with something for a few weeks, we decided it would probably be best to use one of the dancers’ home. I set out to come up with an idea that would give a similar ambience in her home. What I came up with was to use a piece of fabric I found that’s color was close to saffron. Then in Photoshop, I would add a texture to the solid color. In the end I decided not to add the texture to all the images. When lit appropriately, this created the look and feel I was after. The shooting itself was fairly easy. I let what images were most successful from the earlier shoot guide me. The only real challenge was positioning two dancers so that behind them was the background we made and nothing else. Portable backgrounds are only moderate size out of necessity and this can cause difficulties at times. I’m not going to tell you the details of the post-processing step by step this time, but I will list a bunch of resources that I used. Lightroom and Photoshop were the main tools of course. I also used Nik’s Color Efex Pro4 (tonal contrast and glamour glow) and Silver Efex Pro2. 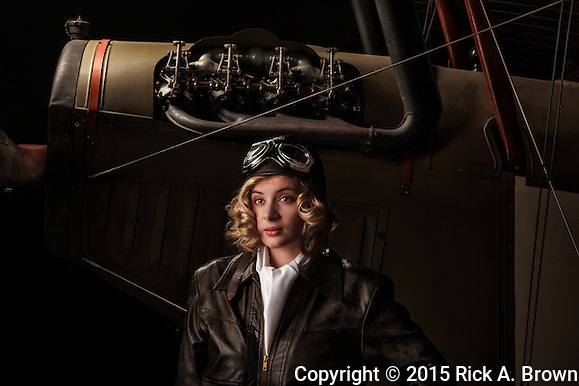 Furthermore, shortly before we shot this, Scott Kelby hosted a guest blog by Regina Pagles, where she detailed her methodology step by step. Now, I did not follow it precisely, but this blog post did provide inspiration for post processing for many of the images. I’m sure you’ll be able to tell which ones. Go take a closer look at the images from this belly dancing shoot, or take a look at my people portfolio. Currently, I am working on producing another personal project. The production on this new one is a little more involved, but keep an eye out for it here. One of the main things anyone interested in photography as a business hears is to find your style. This is something very difficult to do, because creative people can be scared to have all their images look stylistically similar. So for a long time I struggled with how to do that. 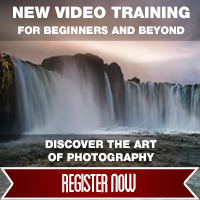 The process started with going to an ASMP event called Portfolio Perfect. I paid close attention to the response of my reviewer. He certainly had a bigger response to my edgy, in your face, exaggerated detail, and exaggerated perspective photos. He even made mention that the other photos I showed him look like they were done by someone else. Next, I looked at what I like. I certainly do tend to like photos with that edgy, larger than life Hollywood movie hero look. Finally, I looked at what other photographers I know, shooting in the same areas and genres are doing. I looked at what I like about their images, what others like about their images, and finally what I don’t like about their images. Finally, I decided on a style that would define most of what I do. Not every photo I shoot fits this mold, but the majority does. This style starts by shooting in tight to my subjects with a wide angle lens when possible. I am also drawn to dramatic skies and backlighting as part of this style. In post processing I will tend towards a wide dynamic range as well as high local contrast, while still maintaining a photographic look. To this end, in Lightroom I developed two presets for my work. Both have high contrast, the highlights are brought down to around -80 and shadows up to around +80. Clarity is high with a setting around +40 on one preset and +60 on the other. The big difference between the two presets is saturation levels, one is very desaturated and the other I increased Vibrance to +30, with the high contrast that makes the colors pop. I prefer to use the low saturation preset with things like military vehicles or silver vehicles where I want to minimize color contamination and use the vibrant preset for everything else. When desired this style can be further augmented in Photoshop and Color Efex Pro4. One way I do this is apply a glow to most of the photo, but Tonal Contrast to my subject. To see my new style in action, take a look at the Shuffle and Boeing 40 departure gallery, the Wings and Wheels gallery, my Aviation Portfolio, or my Automotive Portfolio. The Piper J3 Cub, like many aircraft is available with various power plants, the letter at the end of the model number denotes what engine is on the plane. The P indicates a Cub manufactured with the 50hp Lenape Papoose, a small 3 cylinder radial. There were only approximately 50 Cubs completed this way and from what I’ve heard, these numbers are now down to two. This one, with the color scheme reversed from the typical Cub, resides at Western Antique Aeroplane and Automobile Museum, in Hood River. WAAAM flies this aircraft fairly regularly and took it to the Piper Cub anniversary Airventure at Oshkosh. The plane was trucked across most of the country and then flown the last few miles to the fly-in. I made this particular shot to highlight the unusual look of the Papoose engine. So I positioned the camera as close as I could directly in front of the propeller hub. After looking at the resulting photo, I thought it would look particularly good in B&W, so I took it into Silver Efex Pro2 and processed it with the High Structure Harsh preset and toned it Sepia. 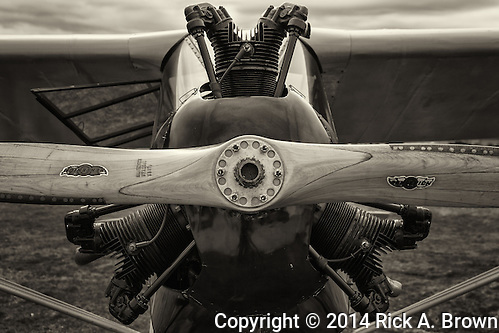 The resulting photograph is my favorite B&W aviation photo up to this point. Take a look at some other images from the March 2014 Second Saturday. The August 2013 Second Saturday at WAAAM was an interesting one, centered around the items in their collection I know the least about, motorcycles. I have always liked the image of the young man coming back from a war a bit disenchanted and drops out of society and wanders around on his motorcycle. However, I’m just not personally comfortable on a two wheeled vehicle moving faster than bicycles. (You can ask the few folks who’ve given me a ride on a motorcycle.) Thus, I’ve never learned that much about them, nowhere near what I’ve learned from approximately 35 years of being fascinated with planes. Thus, it was cool to get a chance to get a closer look at many of WAAAM’s old motorcycles and just days before they acquired a 1947 Indian, the sort of bike that fits my ideal of what a motorcycle should look like. The Command Aire also flew for the first time since coming to WAAAM. It was a bit windy for flying planes of this size, but it all went great and it was really nice seeing this plane flying around. There was also a little Servi-Cycle that was setup as a parts delivery bike for Command Aire and it was really cool seeing these vehicles together. There was also the surprise visit of an Austin Healey club. It was a total shock to see that many Austin Healeys lined up in the field. 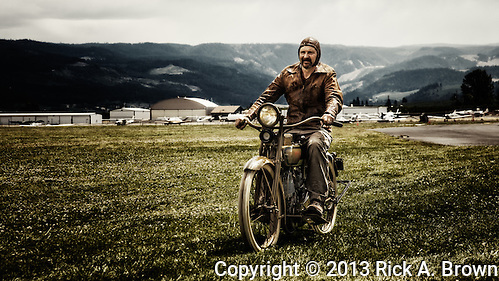 I was able to make an image that day that met the vision in my mind’s eye about the veteran biker pretty well and had a great time along the way. This particular image was worked up using the layered B&W and color technique I described here, except the initial image was not an HDR file. Take a closer look at my 8/2013 Second Saturday Photos, or all of my WAAAM images.